Ehsan Khatami and David Schuster had nearly identical reactions to winning San Jose State University’s 2017-18 Early Career Investigator Award. Both assistant professors used the words “honored” and “humbled” to describe how they felt. The annual award recognizes SJSU academics who are still early in their careers who have completed significant research, scholarship or creative activities (RSCA) in their chosen fields of research. A subcommittee that includes SJSU Research Foundation board members and SJSU faculty reviews each nomination for the award. The subcommittee reviews each nominee’s success in securing funds for RSCA and in publishing in peer-reviewed journals or carrying out other important scholarly or creative activities. Each awardee receives a $1,000 cash award, to be used at their discretion. The assistant professors will be honored during the annual Celebration of Research, April 4 in the Diaz Compean Student Union, where they will give a presentation of recent work. Khatami, who is a professor of physics in the College of Science Department of Physics and Astronomy, said he feels the award provides him incentive to do great work. He is credited with helping build his department’s first modern high-performance computational cluster. He has also — along with some of his students and in collaboration with such top-tier research institutions as MIT, Princeton University, Rice University and the University of California, Davis — conducted research projects in his field of Computational Physics, aspects of which are also known as solid state physics or condensed matter physics. 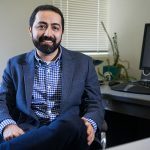 Now in his fourth year at San Jose State, Khatami, who also worked at Georgetown University and UC, Santa Cruz, said he is impressed with the level of support he has received for his research from departmental and university officials. Both Khatami and Schuster have been highly successful at pursuing grants from the National Science Foundation (NSF) — as well as other organizations — to fund their research projects. Khatami helped secure a $900,000 grant as a co-principal investigator and Schuster received one for $500,000 from the NSF’s Early Career Development program. Khatami also individually secured a $171,000 grant from NSF. The NSF grant for Schuster is a five-year award to support his work on improving cybersecurity in the private sector. Schuster is in his fifth year with the College of Social Sciences Department of Psychology and involved in the second year of work on his interdisciplinary research project. 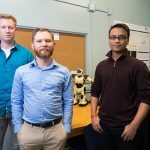 He and his students are involved in the study of human factors, an interdisciplinary science and practice focusing on everything from ergonomics and workplace safety to product design and human-computer interaction. Khatami is also pleased with his research progress, including projects publicized in such prestigious publications as Nature and Science. In the latter publication last fall, theorist Khatami and a team of experimentalist collaborators from Princeton reported their observation of an exotic magnetic phase of matter with ultra-cold atoms that may explain the workings of superconductivity at high temperatures. And in the past two years, Khatami has begun using artificial intelligence, or AI, in his research.